The way we make our Xmas Wreaths has been handed down through the family for years. Firstly you will need a strong stiff wire to make the ring a wire coat hanger is perfect. We always use hay to make the form but you can use straw or sphagnum moss. You will also need Florist’s tying wire (or fuse wire or even a good strong fishing line) to keep everything in place and a pair of pliers/snips to cut the wire. 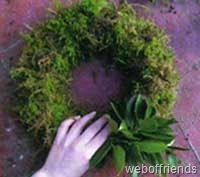 First make a ring with the strong wire and twist the ends tightly together so that they do not come undone, the size of this ring will determine the size of the wreath. Fasten one end of the reel wire to the ring and in one hand, take a handful of hay and hold it to the wire frame where you wish the hay placed. With the other hand (or another person) wrap the wire around the hay to secure it in place. Continue to layer the hay all around the wire frame until the wreath is the thickness you desire. Always keeping the wire taut. Now if you want you can trim the hay – give it a haircut- so it is neat, trim and presentable. Mine never look as neat as this just remember the foliage will hide a lot of it. If you are using the moss then you do exactly the same really, just tease out the moss and the wrap fistfuls at a time around the wire attaching it in the same way, until you have the size / thickness you want. Remember if you make a form with moss you will need to make sure the moss doesn’t dry out. Now you need your foliage, its up to you what greenery you use, we always use Holly, another traditional one is Laurel, but you could use anything you want really so long as it is evergreen and long lasting such as Conifer. Lay the prepared holly on the top of the form adding one piece at a time and securing each with a single wrap of wire. Overlap the holly to ensure no hay is visible. Work round the ring until it is covered with holly. Moss Form at start of adding foliage.